The Next Club Meeting is Tuesday, May 7th, at 7pm. This will be a Dinner meeting with Alan Wacha, KD5IZV, supplying baked potatoes. Skywarn Net Control Information PDF is available here. Skywarn Spotter Reporting Information PDF Here. George Ure, AC7X's Emergency Power Powerpoint it here. George (AC7X) Ure's presentation on EMP is here. Mike (KF5HWM) Mart's Anderson County Map Direction Program is here. It's in Excel format. 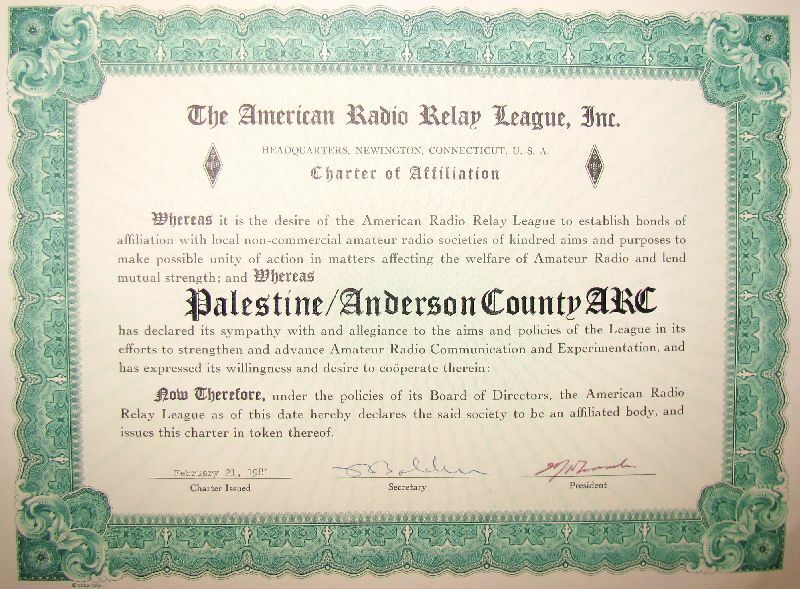 This is the website of The Palestine/Anderson County Amateur Radio Club of Palestine, Texas. Our Club has been serving the local and Amateur Radio Community since 1979. We are an ARRL Special Service Club (our certificate) (our original ARRL Charter) and strive to be an example for Ham Radio. This site is constantly being updated, so please check back often. Your comments are appreciated. Contact K5PAL@arrl.net or PACARC@gmail.com for more information about meetings or the club itself. Our mailing address is P.O. Box 1376, Palestine, Texas 75802 This month's minutes are available here. Net Controls are here. All hams are invited to join our Monday Night Social Nets on the 147.080+(103.5) repeater, meeting at 730pm CT sharing news views, information and the ARRL audio letter every week. Net control rotates among members The preamble is here. 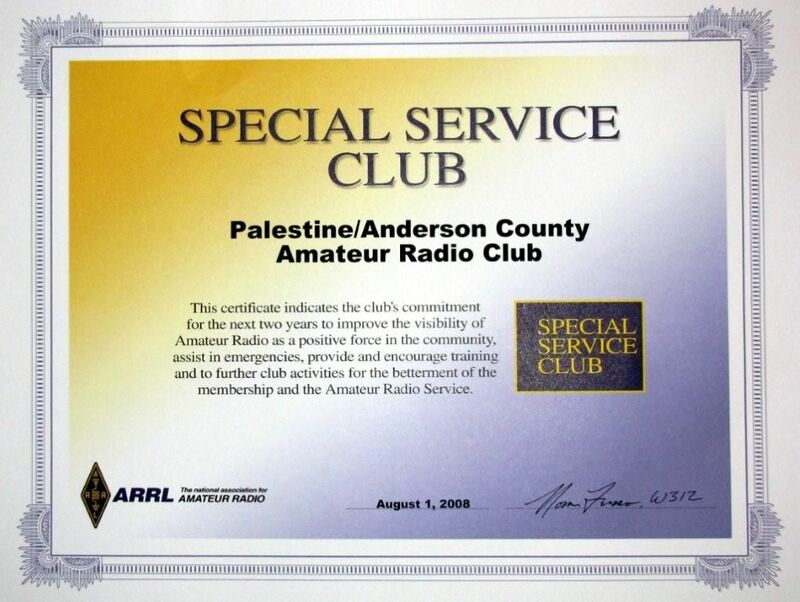 The mission of the Palestine/Anderson County Amateur Radio Club is to provide emergency communications services to the community; to assist other civic organizations; to promote the technical craft of amateur radio through class training and testing; to mentor new members; and enhance fellowship among radio amateurs. Our Bylaws may be found here. A membership application may be downloaded here. Use An Excellent EMCOMM Mode, NBEMS. No Hardware Needed. Download It Here. Field Day 2015 pictures are here. Field Day 2011 pictures are here. Field Day 2010 pictures are here. Field Day 2009 pictures are here. All Pages Copyright © 2004-2019Jeff Montgomery. All Rights Reserved.